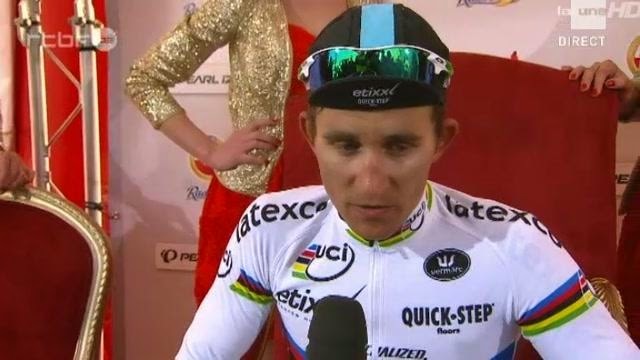 Michal Kwiatkowski on the winners red throne. Winning in the rainbow jersey is such an amazing feeling. I was really suffering on the last lap. On the Cauberg, Ben Hermans was the perfect foil to launch Philippe Gilbert but too many riders formed to spoil the BMC party. The finale had plenty of action. Greg VanAvermaet was another weapon launched by BMC and looked good but at the line, the world champion out punched the puncheurs in style!